Greetings! 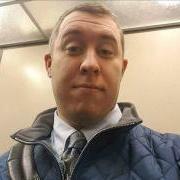 Zagam here with what I hope to be a long, detailed explanation of an incredible tool to be used in World of Warcraft to analyze, diagnose, correct, and observe anything imaginable. 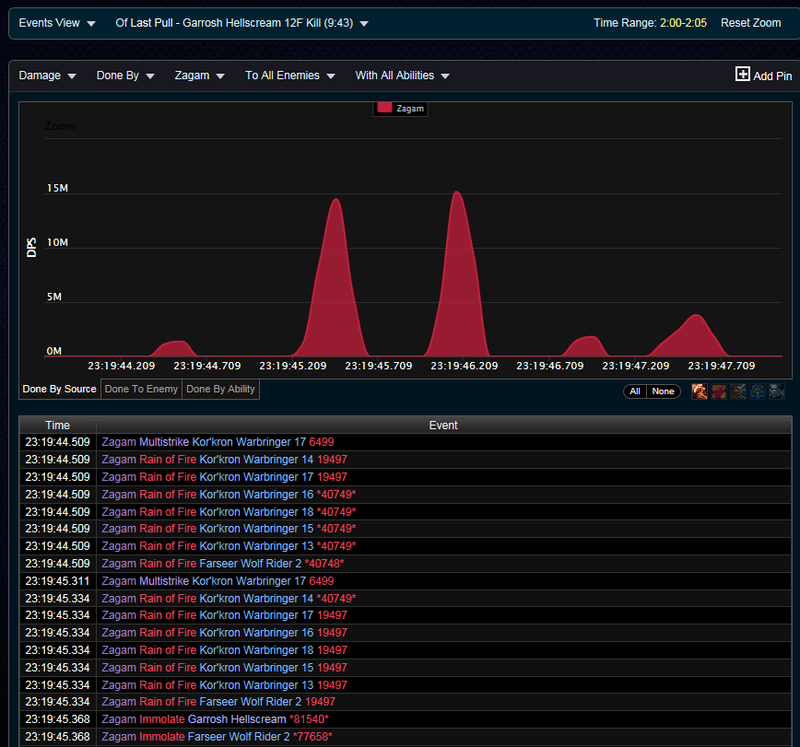 This tool is Warcraftlogs. Install both the Adobe AIR and the Warcraft Logs Uploader. Once you do that, log into World of Warcraft. You'll want to turn on Advanced Logging which can be found by going into your main settings by hitting Escape. Select System and then Network. There should be an option that is unchecked called "Advanced Logging." Select this and then close the menu. As you are preparing to raid, all you have to do is type /combatlog in your chatbox and you will start recording combat logs into a text file. 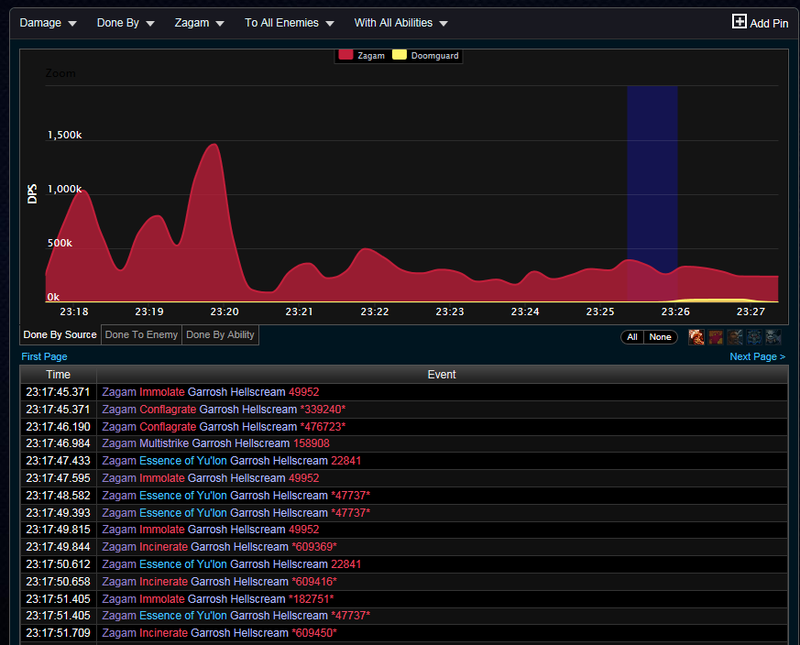 After you are done raiding, deactivate the logging process by typing /combatlog again or simply exit the game client. 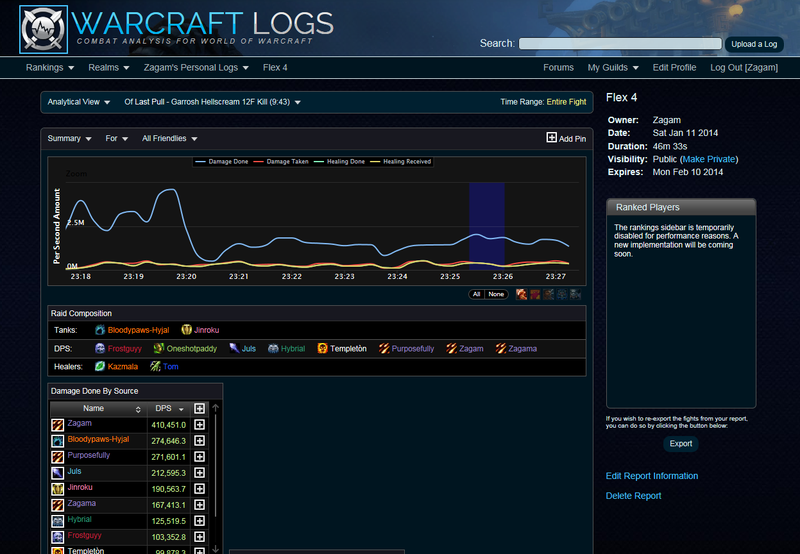 When you've closed the logging process or exited WoW, go to upload the log using the Warcraft Logs Uploader. Use the Browse feature to locate the text file. This can be found in: Program Files -> World of Warcraft - > Logs. Once you upload the file, you can choose to delete the file or archive it. Arching it takes up little space, so I suggest you keep it on your computer. Warcraftlogs will automatically generate a Warcraftlogs Archive folder for you and place the file here. Now it's time to analyze! There is a lot info here including the date of the log, duration of the entire combat log file, whether or not this log is private or public and when the file expires. 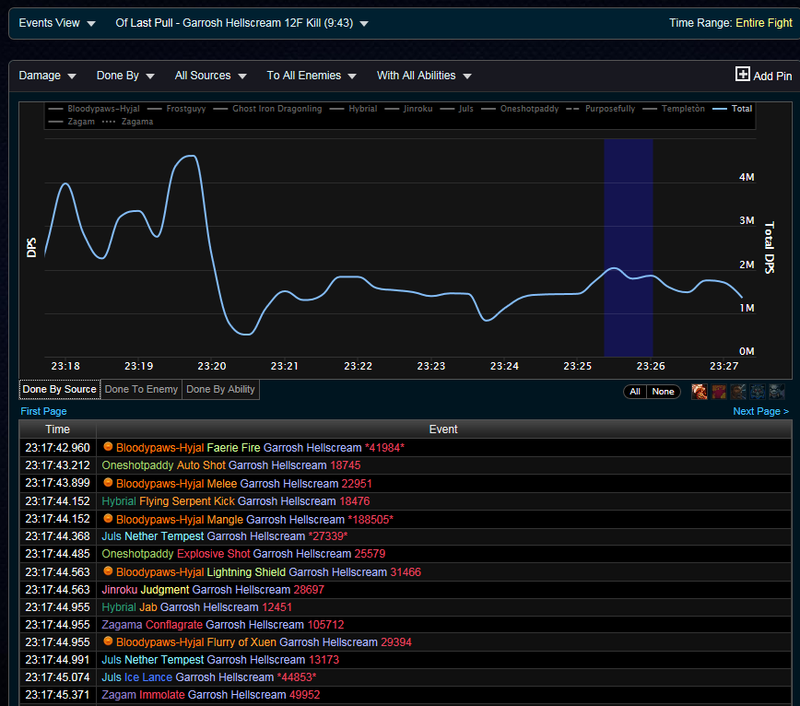 When rankings are included with Warcraftlogs, they will be found on this screen as well. The default display when you load your log will be that of the last pull you had of the raid. 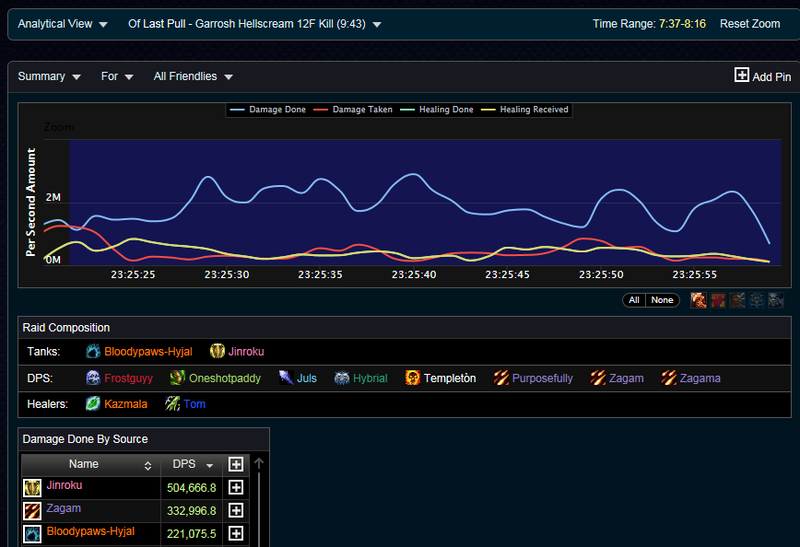 Here, you can see that pull for us is a 9:43 kill of 12 man Flex Garrosh. Let's take a look at some of the other features in more detail. Notice how incredibly easy it is to see all of the members of your raid without having to hover over their abilities to see what their role was. You can immediately notice the Guardian Druid, Protection Paladin, Restoration Druid, Restoration Shaman, and various DPS. 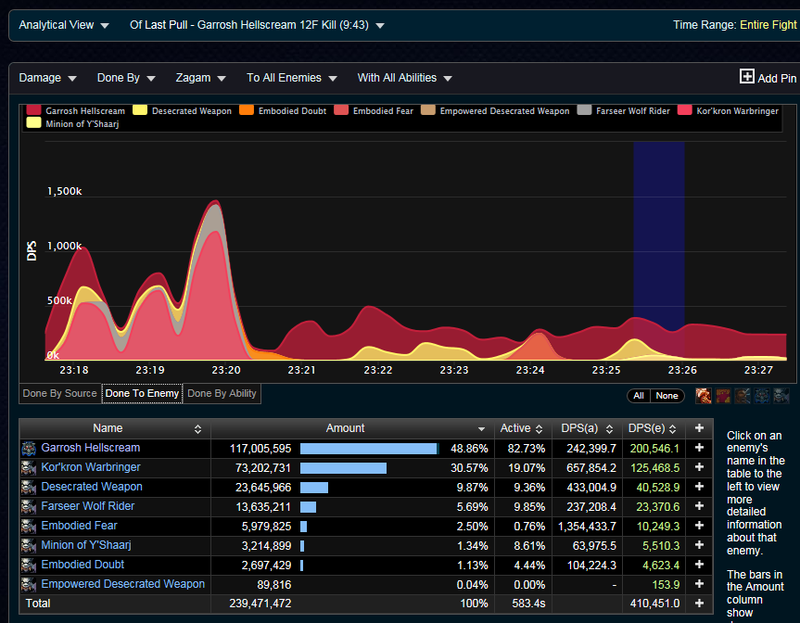 Seeing the specialization of each DPS helps get a sense of what a raid group used to down a particular boss. These are some of the features on the main title page, but the glorious part of Warcraftlogs comes from what's buried inside! Let's take a look at the individual log analysis! 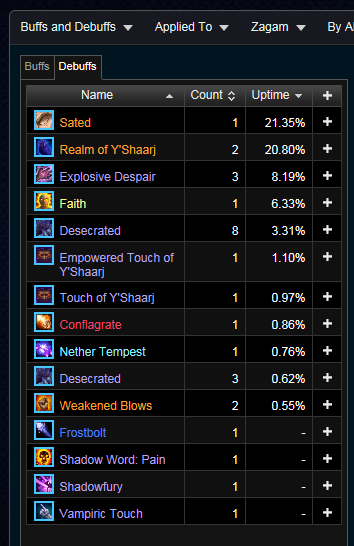 This is the "Done by Source" portion and will show the player and any pets/guardians that player used during that particular parse. DPS(a) is a measure of a player's active DPS. DPS(e) is a measure of a player's effective DPS. 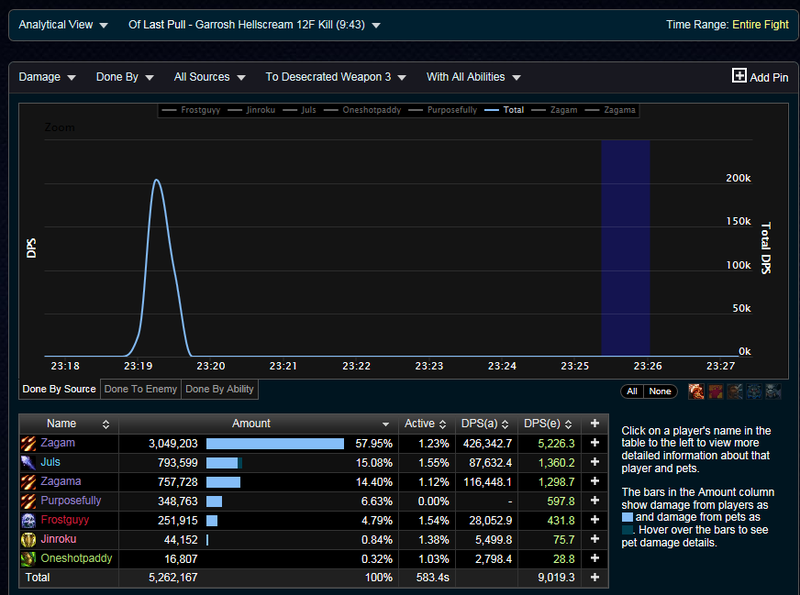 The difference is that active DPS is your average DPS while you are doing something. Doing 10,000,000 damage over 10 seconds while being active for 10 seconds would equal 1,000,000 DPS(a) and 1,000,000 DPS(e). In contrast, doing 10,000,000 damage over 10 seconds while being active for only 8 seconds would give you 1,250,000 DPS(a) but still only 1,000,000 DPS(e). 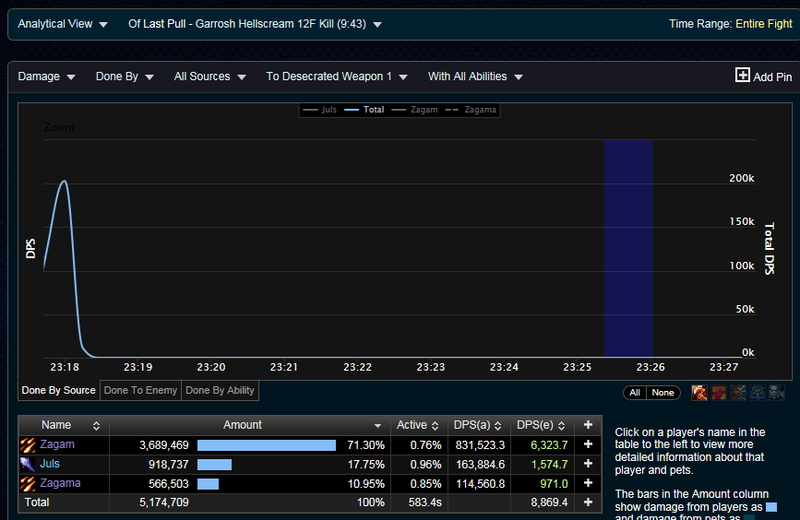 In an actual scenario, a DPS who dies in the first 30 seconds of a fight will have a very high DPS(a). As the fight prolongs, his DPS(e) will drop because his corpse isn't doing much of anything. 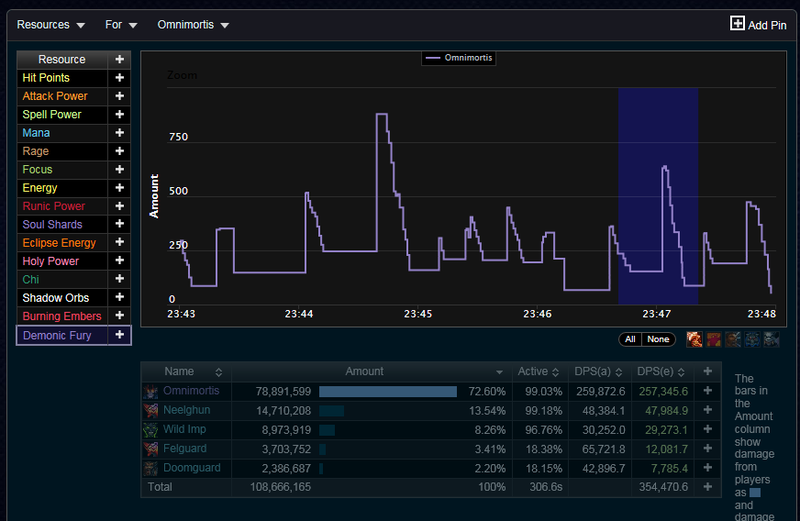 DPS(e) is always the better measure. 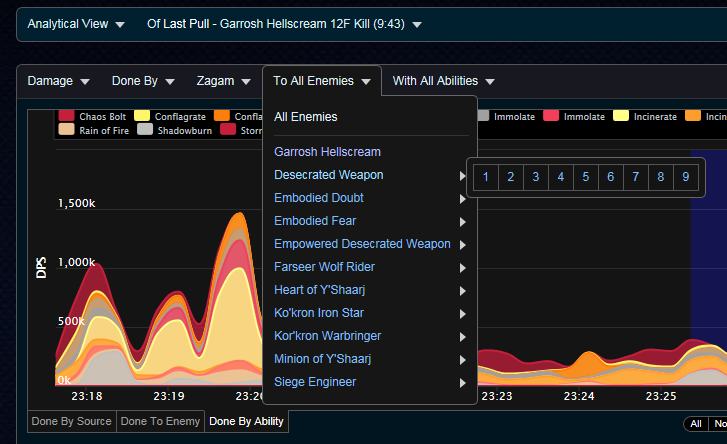 This is an overall view of total damage done to various enemies within an encounter. You can see the portion of time spent on particular enemies under the "Active" calculation which calculates the percentage of time spent on that particular mob. The sum of your time spent on enemies can be over 100% by virtue of dealing damage to multiple enemies at once. 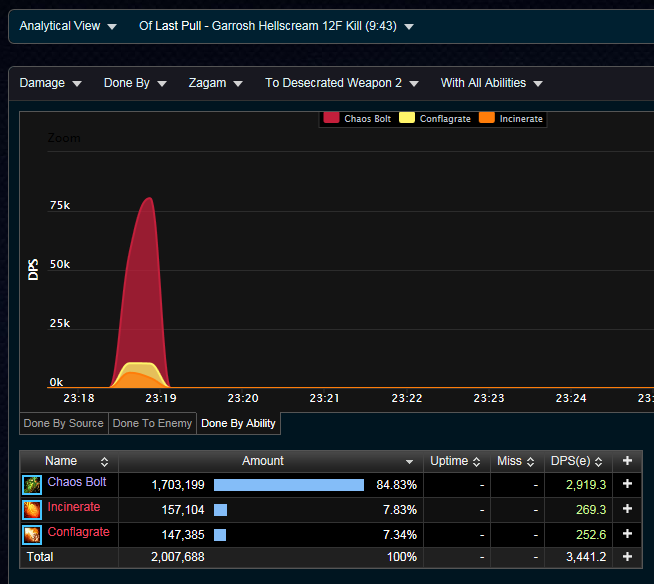 Now we can see when Immolate hit, when it crit, when it critcally ticked, and when it normally ticked. Pretty useful stuff. 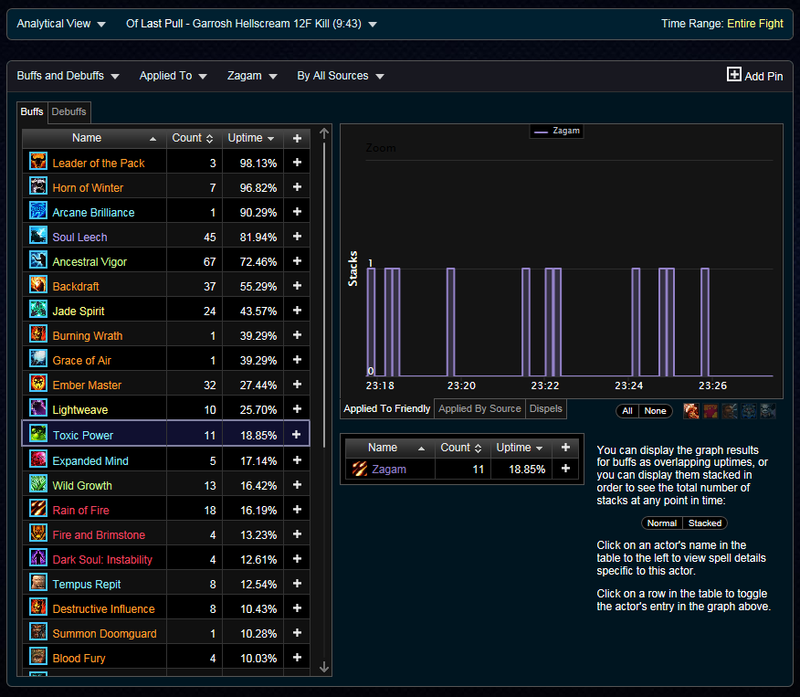 You can now analyze any particular log of any individual to see anything damage or healing related. Let's now take a look at what we are trying to kill as DPS or keep alive as healers! Healing can be done the exact same way by changing your target. It might be interesting to see who was doing a majority of the tank healing and who was doing a majority of the dispels. 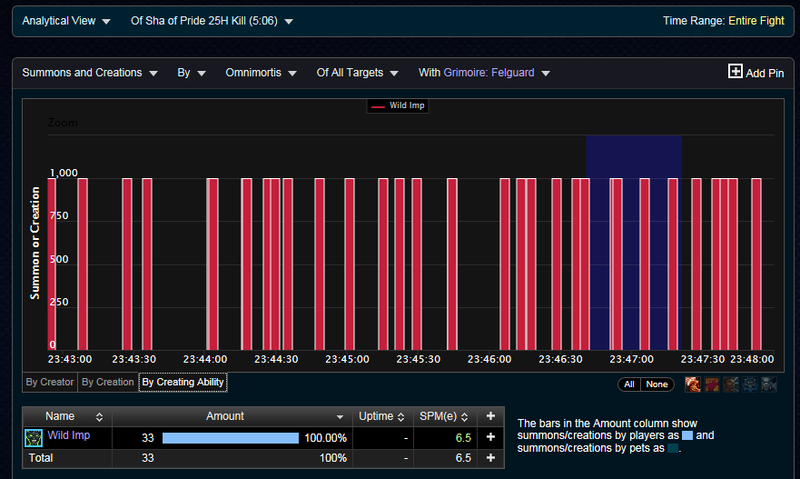 With individual damage and targets explained, let's take a look at a broader view of your entire raid on certain targets! Check it out! Shows who is using Healthstones and for how much they heal. 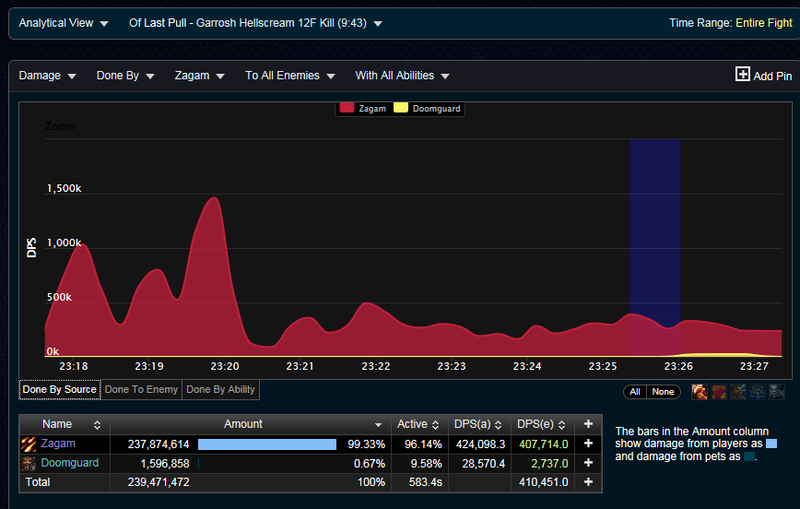 Check out the Guardian Druid's 400k+ heal on one Healthstone! You can track all spells here whether you want to see who received the most healing from a Tranquility or a Divine Hymn or anything else. Notice that this is the Garrosh Encounter. 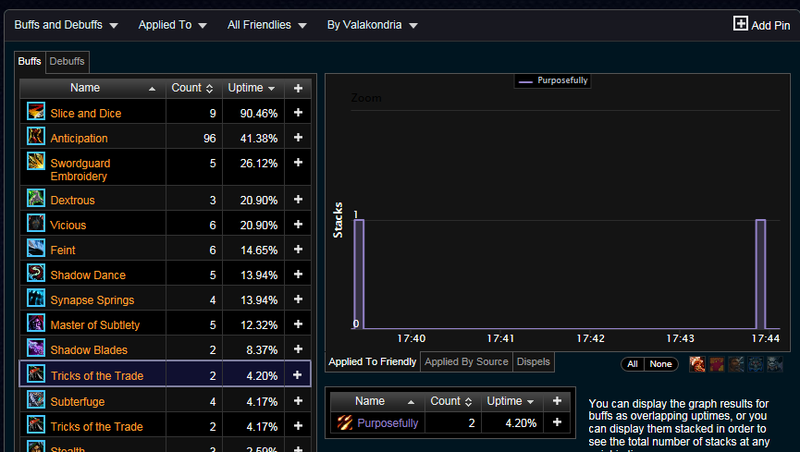 I can find out who is breaking CCs effectively here by tracking my debuffs. I can see that I was mind-controlled one time. I can also see that during that MC, I had Nether Tempest applied to me as well as Shadow Word:Pain. This is a mistake for the Mage and Shadow Priest as they should be using direct damage spells, not DoTs. This is a quick way to identify bad plays during Mind Controls. 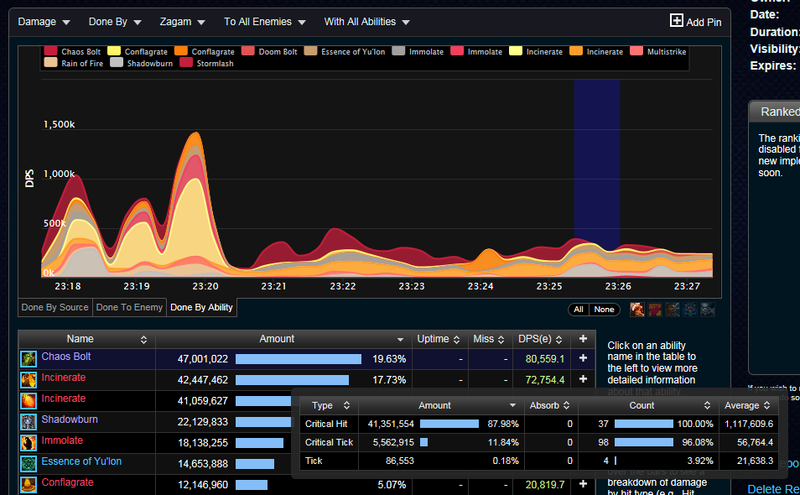 You can also use this to track how often you were targetted by something during an encounter. This is a good way to see if a Rogue is keeping Tricks up. Looks like only two uses in just under 5 minutes here! This is a good opportunity discovery to increase someone's DPS. 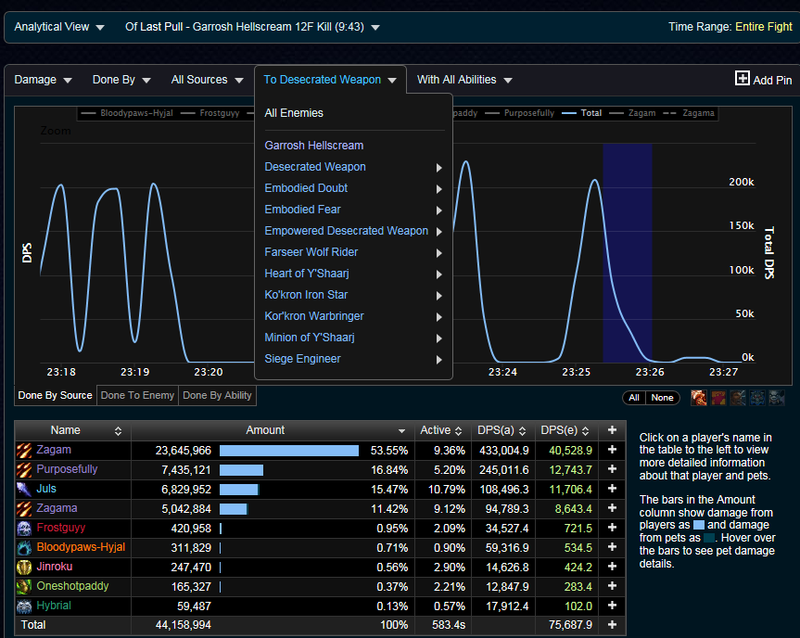 With buffs and debuffs now explained, let's take a look at some other utility reports from Warcraftlogs. 7. 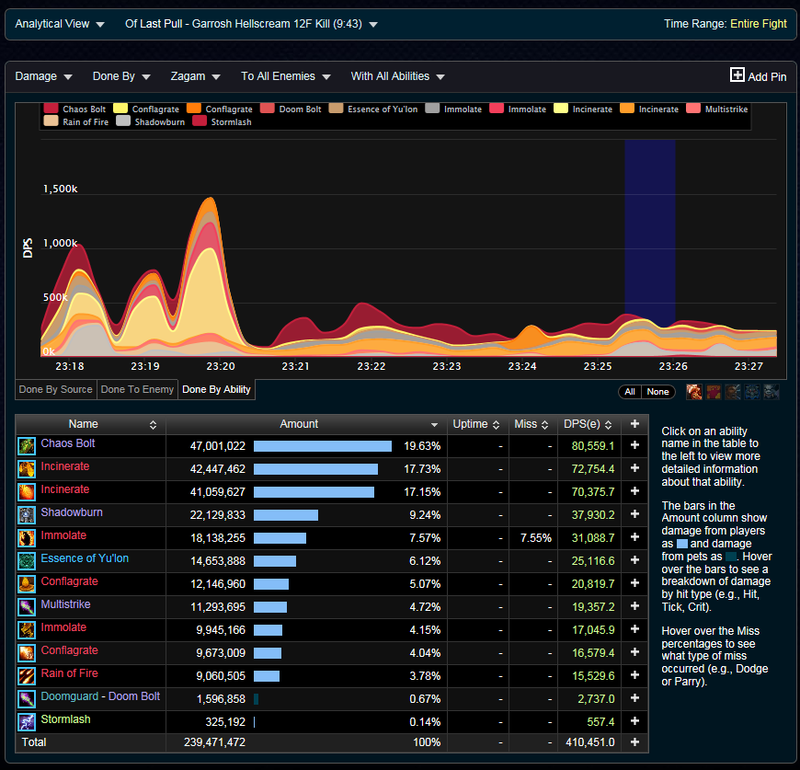 Warcraftlogs - Casts, Events, and Deaths...Oh, my! 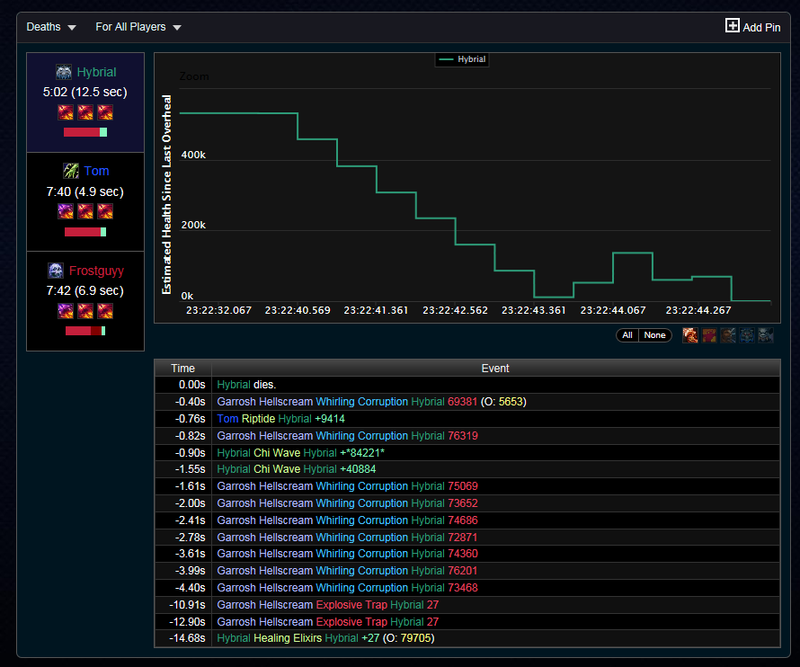 The death log for Warcraftlogs is awesome. It puts all the players who died along with a list of events leading up to that player's death. Notice here we have a Monk highlighted. What this log tells me is over 4.5 seconds, the only heals he received through the Whirling Corruption attack were his own Chi Wave and a Riptide. With respect to his HP, I think the Restoration Shaman made a poor choice of healing spell using Riptide instead of Healing Surge. This is a quick way to identify the cause of death, whether it was the player's fault or a healer's fault. The Monk is not without fault...do you see a Healthstone being used anywhere in there? Now I can see all of my Chaos Bolts for any time frame I desire. You can line something like this up with a trinket proc to see if a Destruction Warlock is casting Chaos Bolt during his or her trinket procs which is an integral part of their DPS. The Events browser has many capabilities that I did not touch up on here. However, all of the analysis can be done in a similar fashion. Best way to learn is to just dive into your logs and explore everything you can see. 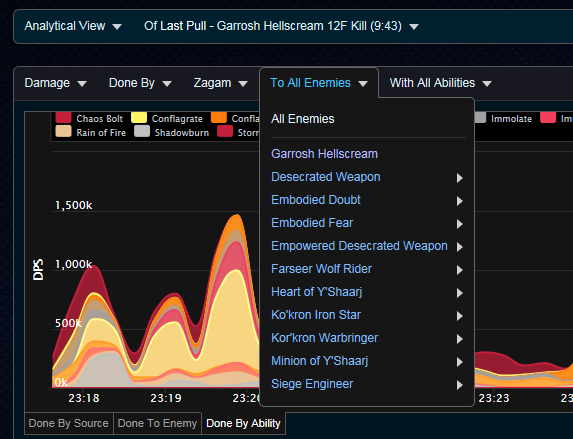 Warcraftlogs has many ways to view just about anything imaginable. The website is still in its beta version with many new updates coming. It is already a very high-functioning program that I strongly advise you all to start using. If you have any questions on how to look at a specific log, let me know and I'll guide you through it! There is still some functionality to the site that is yet to be implemented known as "Pins." When they are more functional and developed, I will use the last reserved post to fill in information about them. 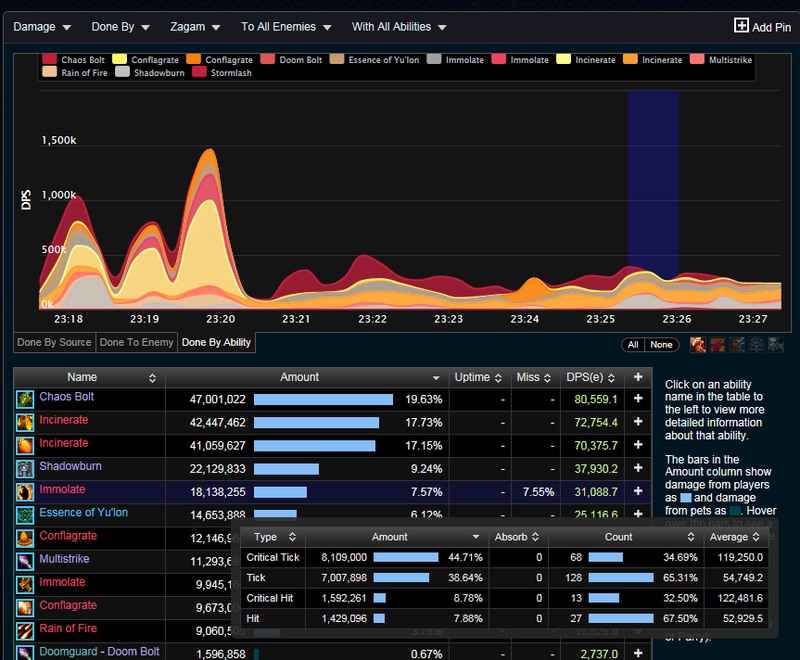 Until then, cheers, and enjoy analyzing you and your guilds' logs! 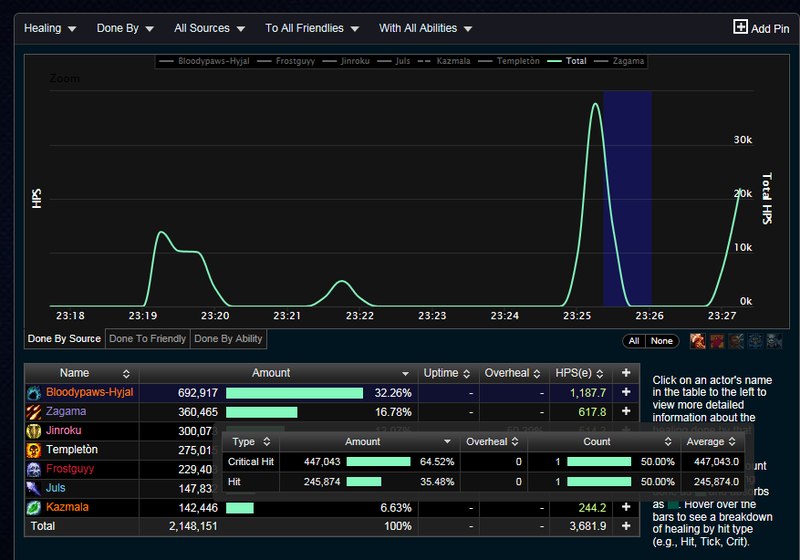 I have been logging my guild runs using warcraftlogs for the last month or so. I'm tempted to start using the advanced combat logging, especially for the combat replay functionality that it enables on warcraftlogs, but I don't know how much additional lag that is going to introduce. I would probably risk it first in a flex run as opposed to normal. Has anyone experienced noticeable lag with this option turned on? I ran 4 raids with Advanced Logging enabled and experienced ZERO performance issues. The difference between advanced log and normal logs is how much space gets taken up in the log file. Basically it just gets bigger and you have to clean out your log file more often. You should be deleting/arching every file after you upload it anyways...I don't see any issue to the file being larger via advanced logging. Wow, this looks nice, I'll definitely register when I get the time. I have to say, after we used this for our weekend alt group and looked through it, it's so much more powerful than WoL is as well as prettier. The fact that it's still in alpha and is this good simply makes me wet with anticipation of what it will be like on official 1.0 for WoD. Also, three cheers for Zag for yet another super useful guide. As a log addict like me, it's always interesting to see new tools. Thank for pointing this one out. I will try this for sure. however, there is an application that does a really good job too. I used it since about few years already, it's called WowCardioRaid (http://tixu.scribe.free.fr/indexen.php), and the latest beta shows combat replay too in a very comprehensive view. It 's not well known, but you should probably take a look at it too if you dont know it. It's just like wol on steroids, and it works insanely well. it's still the best tool to understand what happens. 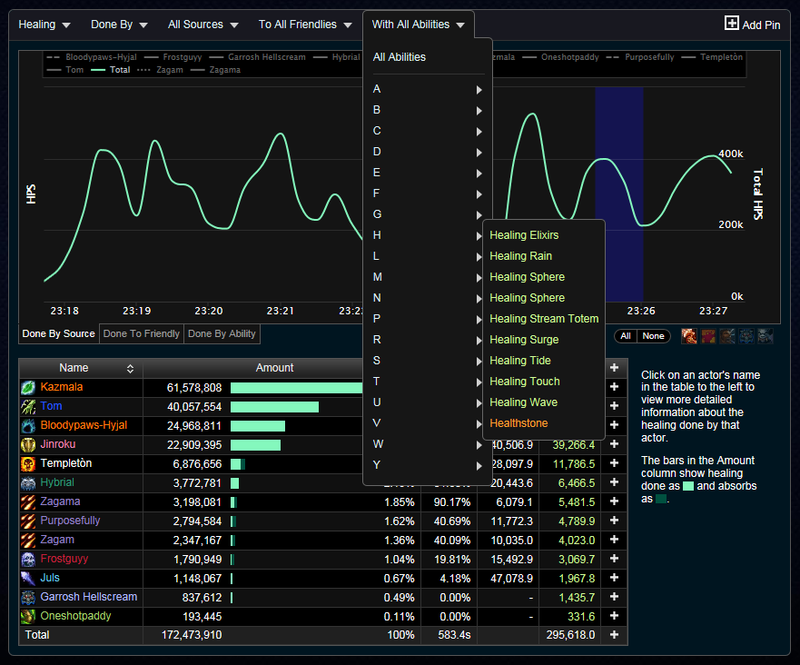 I'll add to the positive feedback for Warcraftlogs. I started using this at the recommendation of Krazyito 6 weeks ago and am impressed. 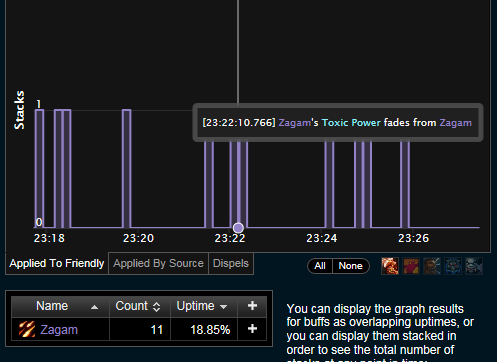 I'll also echo Zagam, I did not see any performance drop off by running advanced logs. Looking forward to where they are headed. Also worth noting that if there are things you'd like to see added or streamlined, create an account and post on their Forums. They are pretty reliable at responding to the feedback left there. This is just a big in how WCL reads the information. The developer already know about this and will fix it in time. Amazing guide! I decided it was time to stop slacking on logging our raids. I am a learning raidleader so I am probably able to improve my raidleading by studying our logs and being able to present people chunks of data that represent their ''mistakes'' etc. I was using World of Logs untill I came across this guide. I instantly fell for Warcraftlogs by just scrolling through this topic and looking at the warcraftlog pictures. It looks alot more user friendly. So I got rid of World of Logs and installed everything for Warcraftlogs instead. I just tried an experimental first upload of our last raids logfile for the first time with the WCL client and I think the general action itself went succesfull, however after looking on the site I came to the conclusion I did something wrong. 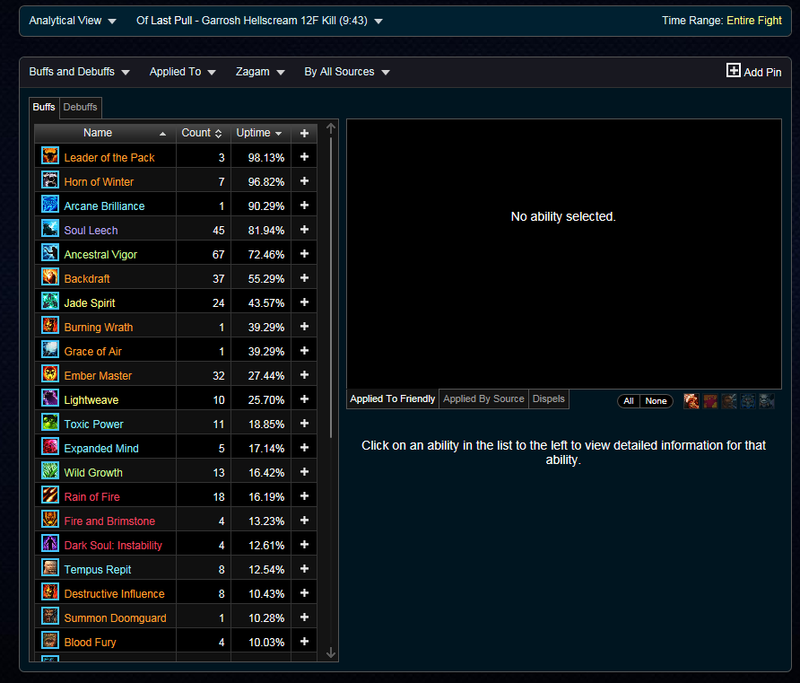 For some reason, even though I am ''in a guild'' on the WCL site I can't see the log I uploaded on the calendar there. Instead my experimental upload got located under my personal logs. Am I completely missing out on an uption in the WCL client which makes me able to select whether to upload as personal log or as guildlog so it will show up in the calendar? Make sure that when you upload a log, that you select where you upload it to. I uploaded one of my logs twice, once under my personal logs, and once under the guild logs. Just FYI, you should probably not stop logging to WoL until WCL is more integrated into other sites with their rankings. I say this mainly because the rankings of WoL will start to be less useful with a smaller data set and some people like to try to get high ranks. I personally will be uploading to both until WoD when Pro-raiders, raid bots, and wow hero's, have WCL integrated it. I didnt see it anywhere, so I'll mention it here. On Warcraft logs, next to every item, You will see a plus sign. 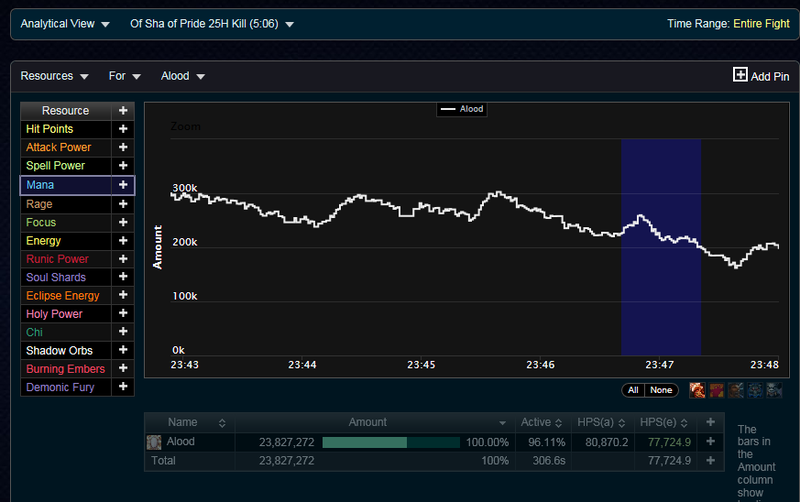 This feature adds that item to your graph. This is a very nice feature. 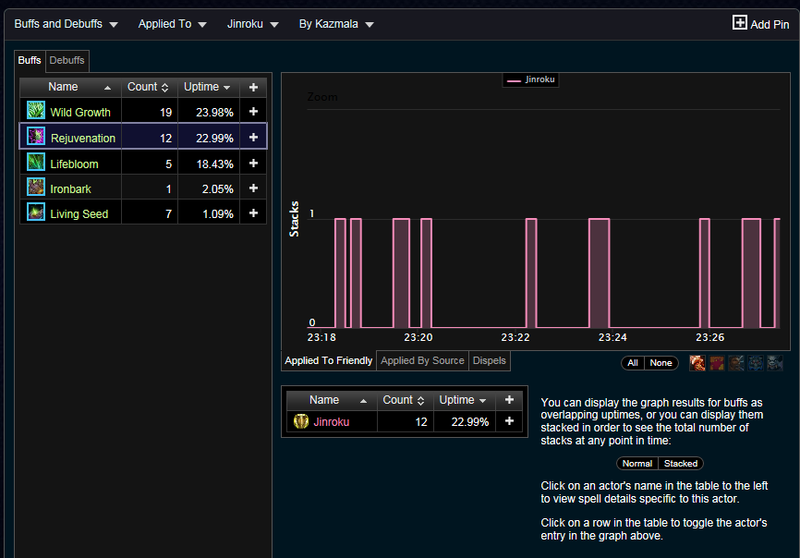 For example, you can go to buffs and add your trinket procs. Then you can go to cast and add chaos bolt casts. 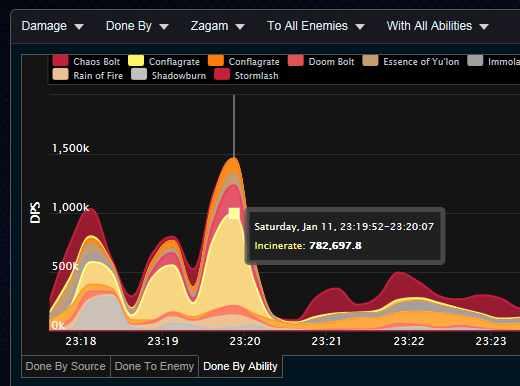 The resulting graph will show whether or not you casted chaos bolts with buffs up. 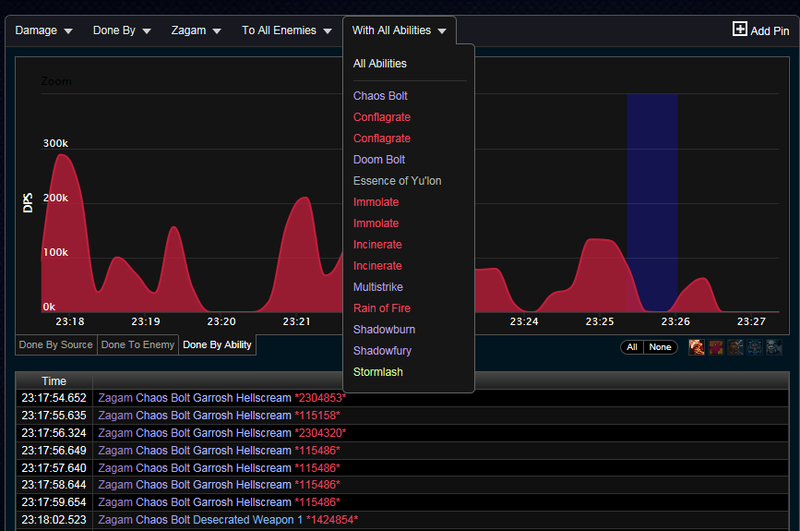 You can also see if you consumed your backdraft stack on a chaosbolt or not, etc, etc. Here's an example of my log w/ Lava Burst and Lava Surge pinned. The light blue is the proc uptime (which gives me a reset, instant, and free Lava Burst), and the yellow line is each cast. You even see when I game the cooldown and spell queuing system to give me a double LvB by doing a zoom on that location. how do you view a mana return like resurgence for a resto shaman? 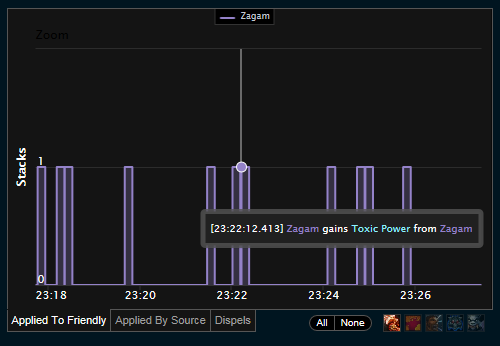 on world of logs its listed as a "power gain" under the "buffs gained" tab. They have also recently added some support for manual expressions. I'm not too familiar with that language to experiment and see if this information is possible through that.